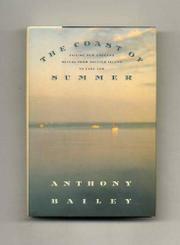  In prose as gentle as the breezes that push his craft, Bailey (The Outer Banks, 1989, etc.) tells of his summer voyage aboard the good ship Lochinvar, coasting along a piece of New England. The design of Bailey's sailing journey was straightforward: Cruise, anchor, explore, then cruise on. Heading out from his once home port of Stonington, Conn., he angles south to Long Island and then northeast to his turnaround at Provincetown on Cape Cod. He and his wife are in no hurry as they do a slow crawl through the islands--Shelter and Gardiners, Fishers and Block, Nantucket and Martha's Vineyard--with many a landfall in between. Although Bailey clearly loves sailing, and does a lyrical job of summoning salt, sea, and air--not to mention halyard, mainsheet, and jib--he is really in his element when he steps on terra firma. He putters around, pokes his nose into the quotidian, then laces it with history, geography, and biography (of the area's historic families, and of his pals) to give a real measure of the place. Bailey pulls you right to his side on a most amiable walking/boating tour: an inspired guide in a fascinating locale with a rich past. The book is not all drowsy idyll, as there are a number of close shaves with other boats and a visit from Bob, 1991's lulu of a hurricane, which they ride out from shore. As might be expected from a product of the pre-jet-propelled New Yorker under William Shawn, Bailey's writing flashes with drollery and wit, a graceful; he's a comfortable stylist who works on the reader like a masseur. From the shoals of Madaket to Sow and Pigs reef, Bailey wraps the reader up in this highly entertaining sea passage.